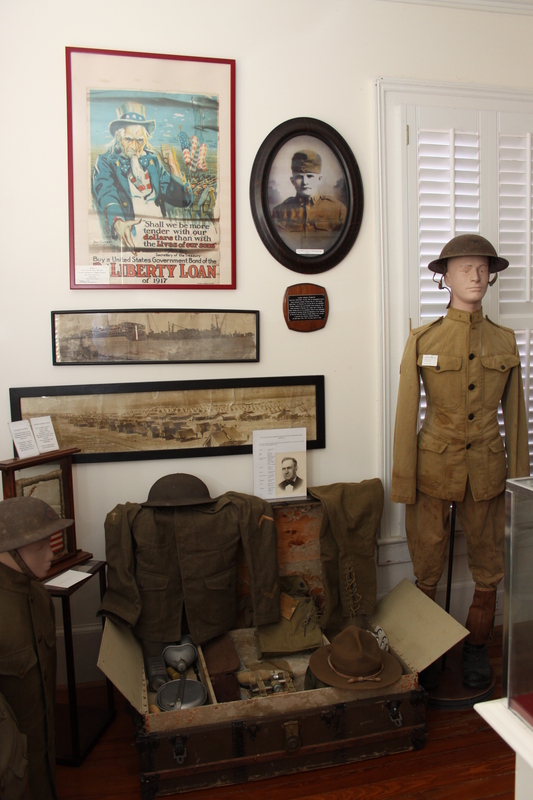 The Duplin County Veterans Museum is proudly presenting a World War One exhibit. The exhibit commemorates the entry of the United States into the war one hundred years ago in 1917. The exhibit includes memorabilia froom the war itself such as uniforms, helmets, firearms and personal items such as letters from the front. Another featured section of the display is dedicated to the role of Faison native, Samson L. Faison, in the breaking of the German army’s Hindenburg Line which led to the eventual defeat of Germany and its allies. This German surrender occurred on November 11, 1918 at 11 AM. This day was known as Armistice Day for many years but was changed to Veterans Day. The exhibit includes timelines of World War One events and battles together with pictures of the leading historical figures of the time and actual scenes photographed from the front lines. The Duplin Historical Society provided a comprehensive list for the exhibit of Duplin County natives who lost their lives fighting in the war itself or who succumbed from the impact of the great influenza pandemic which swept across the world in the waning days of the war and immediately thereafter. 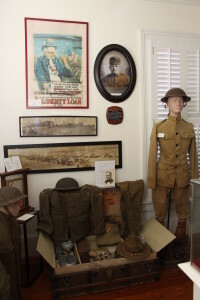 The Duplin County Veterans Museum is dedicated to preserving the memory of Duplin citizens who have served in the armed forces of the United States of America. The museum is an ongoing memorial to celebrate the brave men and women of all races who have endured the hardships of war or peacetime service to help preserve an America which honors freedom and the dignity of all its people. The Board of Directors encourages everyone to visit the museum which is located in the historic L. P. Best House on Hill Street in Warsaw as a way of showing your patriotism and your respect to those who have served and to those who currently serve. We hope to see you soon. Make plans to visit our museum. We are open Thursdays and Fridays from 1:00 to 4:00 PM.